Jared Goff’s most recent postseason outing was easily his best, but even that might not have been enough. Los Angeles Rams quarterback Jared Goff turned 24 in October, and — at the time — was in the hunt for the NFL MVP award. Through the first three months of the season, he had 26 touchdowns, six interceptions, and a 113.5 passer rating. Then seven touchdowns and seven interceptions in his last seven games took some gloss off a stellar third season in the NFL. 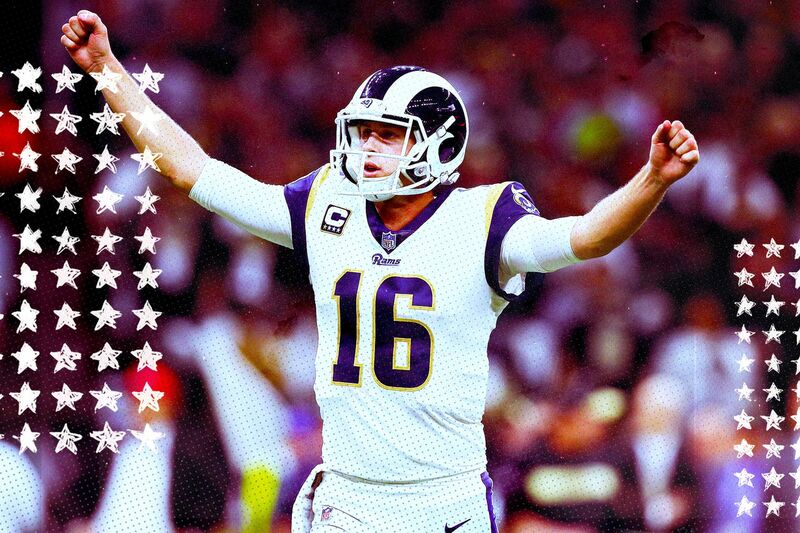 But now Goff has the chance to cap that season with a win in Super Bowl 53. Just one problem: To get the job done, he’ll have to outduel the best postseason quarterback ever. Tom Brady will play in his ninth Super Bowl — three more than any other player in NFL history — and will try to win the New England Patriots a Lombardi Trophy for a sixth time. That’s a daunting task for the Rams, who have only four players — Aqib Talib, C.J. Anderson, Brandin Cooks, and Sam Shields — with any Super Bowl experience. While Brady has played in 39 career playoff games, Goff has played in three. Has Goff shown in his limited time in the postseason that he has what it takes to get the job done against the Patriots? Well, not always. The Rams offense finished the 2017 regular season with a league-leading 29.9 points per game, but couldn’t get going against the Falcons. At the heart of the offensive issues for Los Angeles was Todd Gurley’s struggles on the ground. The All-Pro running back finished the game with 101 rushing yards, but 58 of those yards came on four rushes in the fourth quarter. Prior to that he had only 43 yards on 10 carries through the first three quarters of the game. Goff struggled to keep the chains moving early — the Rams had 10 offensive plays and three punts on their first three drives — and just like that it was a 13-0 lead for the Falcons early in the second quarter. The Rams settled for a field goal on the latter drive after a holding penalty pushed them back, but Goff’s two throws had the team down only 13-10 at halftime. Then the Falcons blew the game open in the second half and pushed the game out of reach for the sluggish Los Angeles offense. Ultimately, it was his inefficiency that kept the Rams from keeping up with the Falcons. He completed just 53.3 percent of his passes, and even that was an inflated number after he strung together 10 straight completions during one drive in the final minutes of the fourth quarter. Only 11 of his completions came in the first three quarters. “I think it took a little longer than usual to settle in,” Goff told the Los Angeles Times after the game. By the time the Rams quarterback looked like himself with any consistency, it was already too late. His return to the playoffs was pretty similar statistically to his debut a year earlier. Goff completed 53.6 percent of his passes and, again, didn’t do much to help the team while also not doing much to hurt it. The difference this time was the Rams’ rushing attack got going in a big way. Gurley had 115 yards on 16 attempts, and C.J. Anderson had 123 yards on 23 attempts. The Rams committed to a smashmouth style of football against Dallas, and the offensive line dominated the line of scrimmage. Goff’s lack of contribution to the Rams’ scoring total may make it look like he had a bad game, but he really just wasn’t asked to do much. He threw the ball only twice in the fourth quarter and didn’t have his soul taken by the Cowboys defense. Aqib Talib reminded the world as much with some colorful language after the game. But the Rams really could’ve blown out Dallas in a bigger way if Goff was able to punctuate long, ball-control drives with touchdowns in the red zone. The team’s first drive of the game could’ve ended with a touchdown, but Goff was rushed into an incomplete pass on third down with multiple open receivers. The Rams settled for a 25-yard field goal instead. And when a pair of throws to Brandin Cooks in the end zone weren’t completed on the next drive, the Rams had to kick a 23-yard field goal. Eventually the Rams got in the end zone. Goff’s inability to complement the successful rushing attack with drive-ending touchdowns almost proved costly, though. Finally, we saw a version of Goff that resembled his regular season self when the Rams played the Saints in the NFC Championship. It wasn’t exactly a prolific day for the third-year quarterback, but he completed 62.5 percent of his passes and nearly reached 300 passing yards. Both were close to his 2018 regular season averages of 64.9 percent and 293 yards. Those numbers are more impressive considering the Rams offense had serious difficulty with the noise in the Superdome in New Orleans. Several times, Goff was shown on the FOX broadcast struggling to hear Rams coach Sean McVay through his headset. Goff was especially good in the second half and overtime, where he completed 13 of his 20 passes for 183 yards. His only interception of the game clanged off the hands of Todd Gurley. After that, he was pretty damn good. The Saints only had one play that gained more than 25 yards against the Rams defense, and it probably should’ve been intercepted. But Rams receivers Brandin Cooks, Gerald Everett, and Josh Reynolds each hauled in a deep pass for a gain of more than 30 yards. The first was a beautiful perfect pass down the left sideline to Cooks that set up a desperately needed touchdown before halftime. The Rams didn’t have the best day running the ball against the Saints. When they needed Goff to step up in the biggest moments, he did. That bodes well for his chances at showing up big against the Patriots in Super Bowl 53.